Korova's peanut butter mini cookies are a classic favorite with a twist! Each package contains 10 cookies that are approximately 10mg each. Korova is a well known Oakland California original brand that began producing their quality goods out of the founders home kitchen back in 2010. Wondering what Korova’s three-eyed cow really represents? Korova means Cow in Russian. It's a reference to the Stanley Kubrick film 'A Clockwork Orange' in where characters patronize the Korova Milk Bar where infused products are consumed. If you've ever seen this cult classic you'll also quickly recognize the bowler cap our mascot wears is just like the hat worn by the main character, Alex. The third eye refers to the gate that leads to inner realms and spaces of higher consciousness. 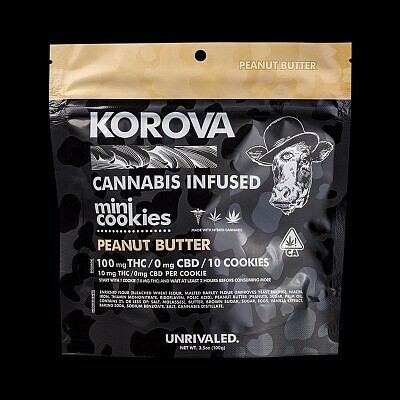 Return to the main menu to see other Korova products ready for delivery today in your area, or to see products coming soon, or to just learn more about the all time favorite of many experienced consumers visit, www.korovaedibles.com.